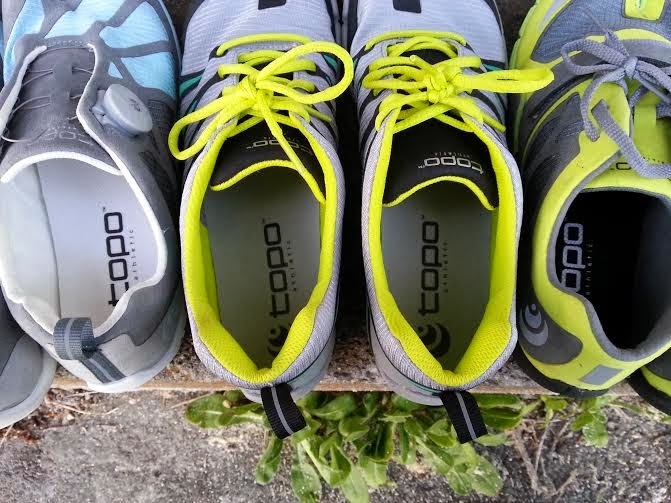 I have been very lucky to get to try three styles of shoe from Topo Athletic. From left to right, the RR, ST, and RX. All three are zero drop and over all pretty light weight. They are definitely on par with the other big minimal shoe brands as far as weight goes. The significant differences are the lacing systems and the split toe. I LOVE split toe style! It allows for more agile movement and I like the Tabi style look. They are all similar in all ways as far as weight, fit, width, materials, and all are zero drop. The ST is a little more padded around the ankle. They all have about the same width and each of the lacing systems have benefits and I am able to cinch the shoes down to fit my narrow feet. I like all of the lacing systems and think that it is based more on your style and what you prefer. I found them all to present no problems so it's really up to you based on style and activity. I found that the width was great for my foot. (long and skinny with a wider splay) Lots of room to splay and move freely. The lacing systems could accommodate a wider foot and they have a nice shape for the splay. I didn't have any rubbing from seams on the inside and they are quite comfortable with or without socks. I like to wear my shoes without socks to increase the ground feel. 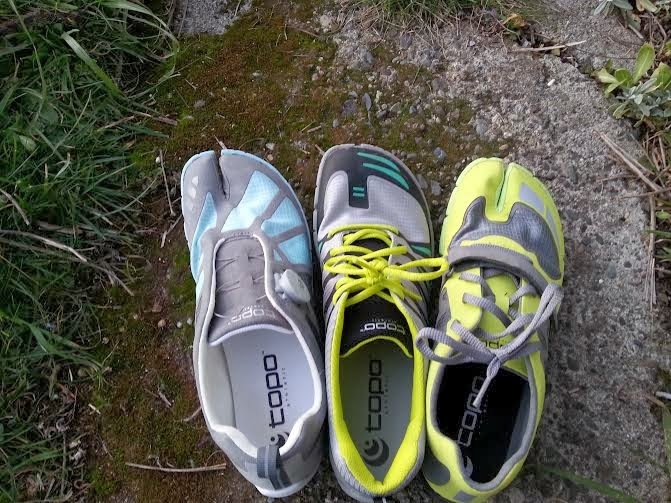 All three have heat welded breathable mesh uppers are soft on the inside and have good ventilation and breathability. The grass is always damp here fall through spring here so I always have wet feet. These dry pretty quickly. The RR and ST have better ground feel than the RX but it is a pretty fine distinction. 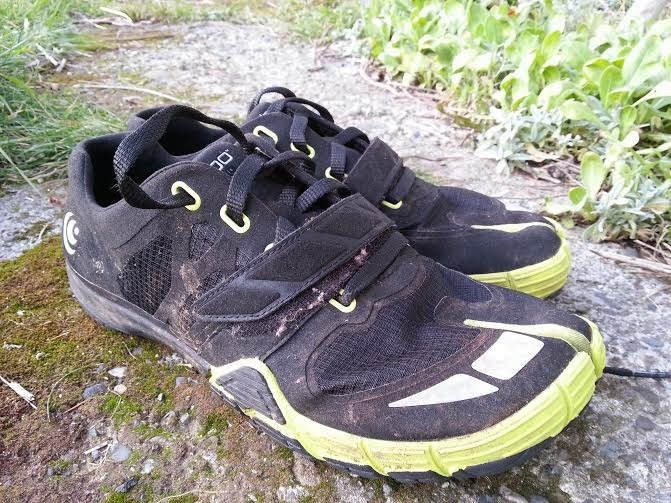 The RX has a stiffer sole and is more for a gym shoe. Nice stable surface to move from. The RX and RR have removable 3mm EVA footbed. The shoes are comfortable with or without it. It does give a little more groudfeel without it. The only issue I had with the RX and RR, and I will say up front that I think it is particular to me since I don't wear traditional shoes, is the heel tab is super stiff. It gave me blisters on both feet and from both the RX and RR. The ST didn't rub me wrong at all anywhere on my feet. They were super comfy right out of the box. The thing is though, I like the split toe look better. I like the added movement you get from the split toe. I have read other reviews and spoken to other people who didn't have any issues with the stiff heel tab. My oldest spawn didn't have any issues either. I just have super soft achilles heels haha! My teen spawn is testing out the mens RX. Love is how he describes his experience with them. 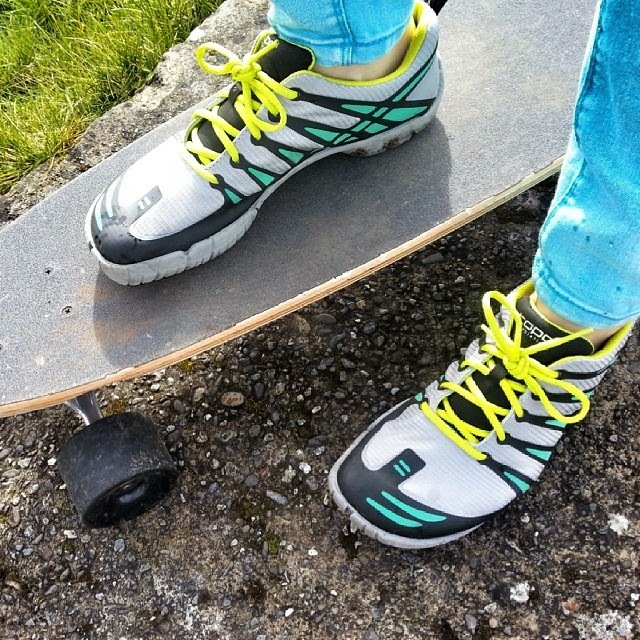 He wears them to longboard and to run around in general. He is a pretty active person. He loves the look and feel of the split toe as well as the colors. He has been able to wear regular socks loosened at the toes when he can't find his split toe socks. He says he digs the style and has had zero complaints in how they fit. He was a big fan of VFF due to the splitting of his toes. 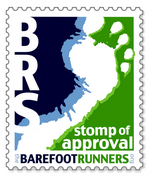 He likes that so the split toe of the RX was great for him. The RX has a stack height of 14mm including a 4mm footbed. 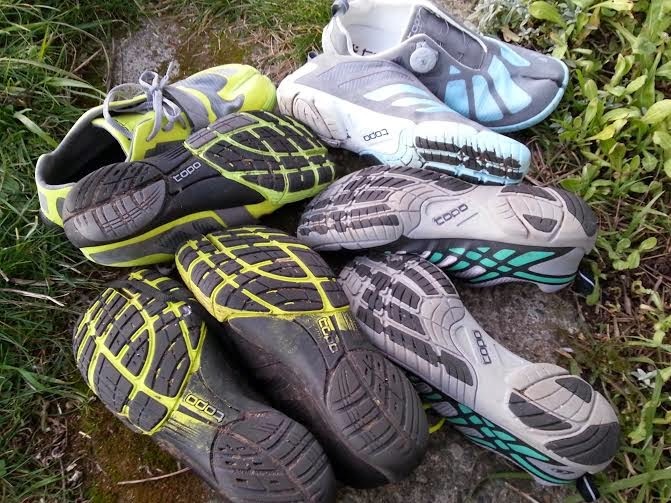 Pretty great traction on all pairs. It is nice and grippy for all street activities both in wet and dry conditions as well as light trails. Not the greatest of ground feel but I have found the padding to be nice for longer walks and hikes. For those that are into minimal shoes, they are on par with maybe a Pace Glove and far from the of ground feel of the Vapor Glove. 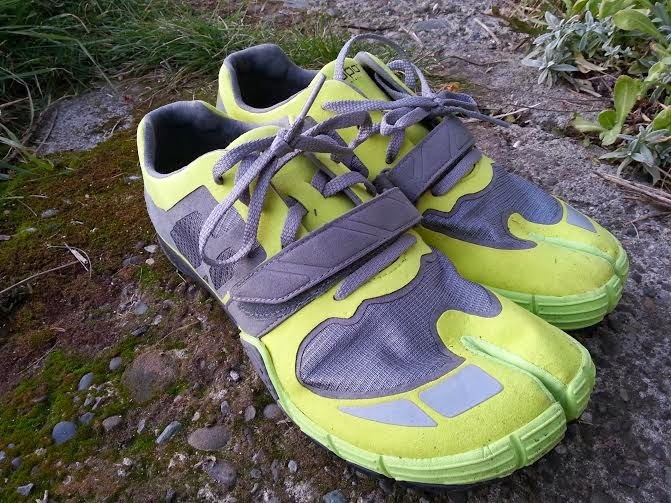 Similar in fit and heft as the B2Run shoes by Eric Orton. Overall, the ST is my favorite style but only because the other two styles have a stiff heel tab and my feet are not conditioned to it. Once that is conditioned, although I'm not looking forward to that part, they will be great. The ST is basically a RR without the split toe. I happen to like the split toe so want a version that has a nice soft heel tab like the ST but with a split toe. Or the speedy RR with a soft heel tab. Same difference really. 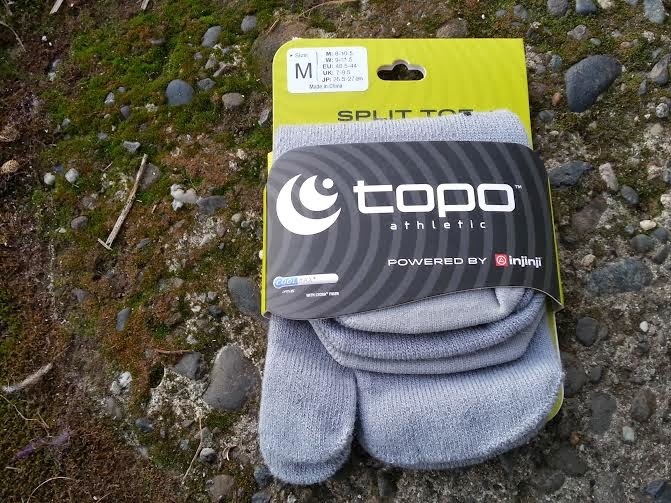 The split toe socks are powered by injinji. Super soft and comfy! I love the speed lace of the RR! 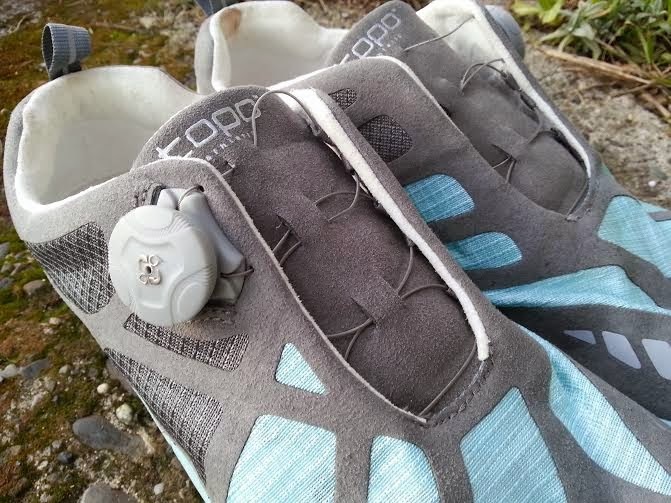 It really is brilliant and eliminates the dreaded untied laces. The RR are super light coming in at just over 5 ounces each. There is a lifetime warranty on the Boa Micro Adjustable closure. The RR and the ST are most similar in weight and ground feel. They both have a 13mm stack height including the removable 3mm insole. As I mentioned before the RX have a bit more heft to them. They are still super light but have a bit stiffer sole than the RR and ST. I really like the lace and velcro lacing systems. This are more for fitness and they make a great gym shoe. The sole is a nice sturdy base for lots of movement especially if you are newer to minimal shoes. It absolutely can be a running shoe. I really like the hook and loop at that part of the foot. It gives even more control over the fit. 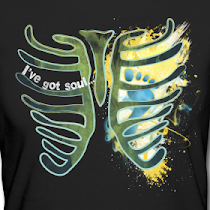 All of them have lovely on trend colors for both mens and women's styles. I would recommend to anyone trying these out. I don't think you could go wrong with any of the styles. Wan to win a pair?? Follow my tweets @AngieBeeHotz and say Hello!